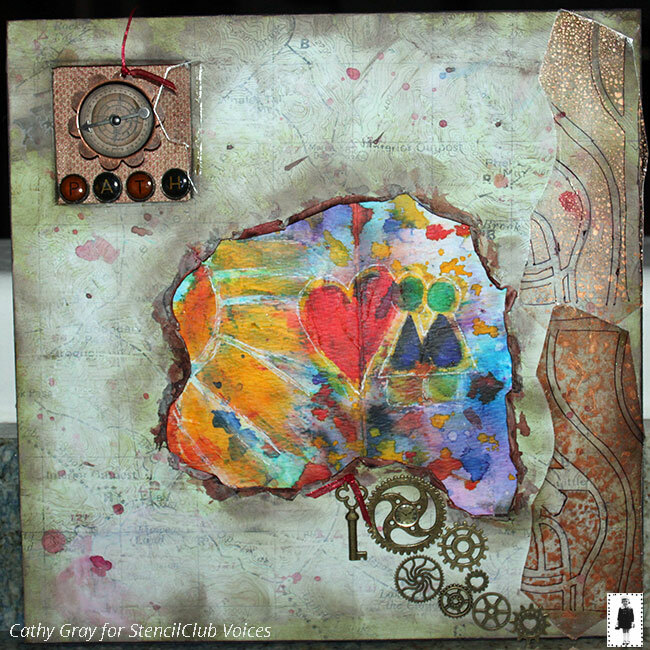 Mixed media wall art, to scrapbook layouts, to art journals our StencilClub Voices for November shined their unique gifts on Nathalie Kalbach's Fragmented set. We have Tina Lewis Stanley, Natalie May, Pat Newman, and Cathy Gray to thank for this month's art! I wanted to honor my anniversary with the first spread I did. I started with washi tape, acrylic paint, and inks, then added background texture stenciling punchinella (aka sequin waste), and the 9x12 October 2016 StencilClub by Mary Beth Shaw. 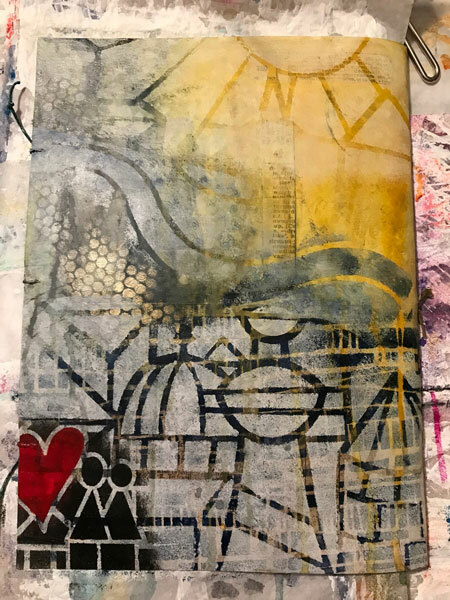 Next I stenciled using the November 2017 stencils. I added final details with acrylic paint in the heart and Uni Posca white pen and a black pens. 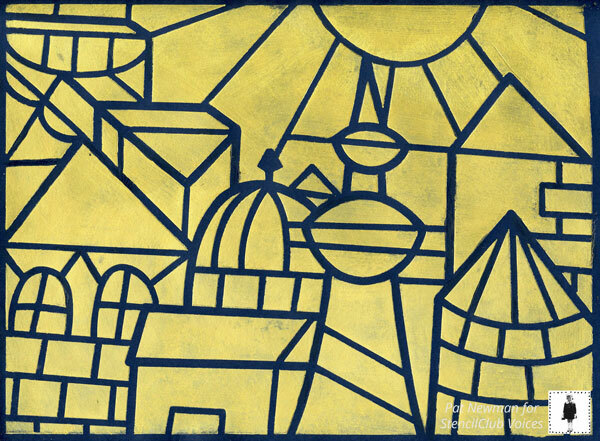 All 3 stencils were used for the sun, wind, cityscape and people. Really enjoyed this process! This page was inspired by Effy Wild's Mix Tape 1 class. 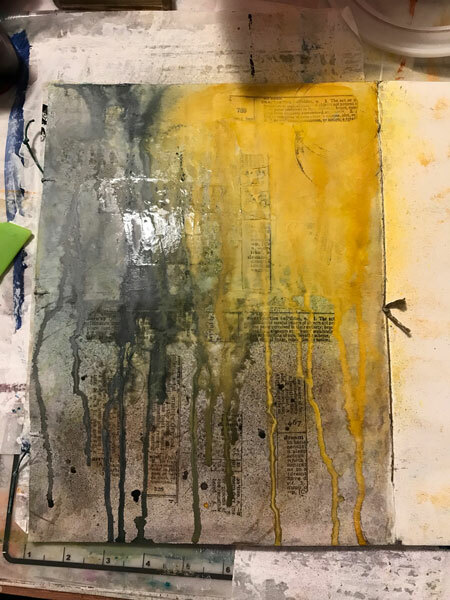 The background is created by 'gluing down' with matte medium some old paper towels and diaper wipes I used to blot other projects--they inspired my palette. I embellished them with more acrylic paint, acrylic inks and Brusho pigment powder. I then stenciled in the cityscape (with bridge), the space ships and moon (with a man on the moon). I added lyrics from the song "Hey Mr. Spaceman" by the Byrds which I glazed over. I used a Uni Posca in white and Sakura glaze pens in yellow and black to add detail throughout. And the main lyric I wanted to pop I out across the buildings in white. Another fun page to do! I love the shapes in this stencil set and thought it would be great to use on a layout! 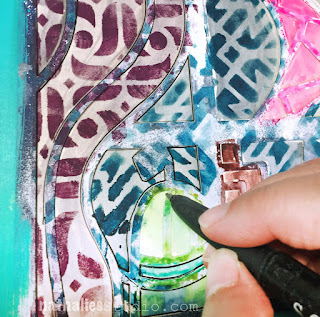 I started with Modelling paste through the stencil then once dry, I really drowned the cardstock in Moon Shadow Mists from Lindy's Stamp Gang in Treasure Island Aqua, Tawny Turquoise & Buccaneer Bay Blue. Once dry, that gorgeous shimmer came out. I trimmed the cardstock down to be more of a feature panel, framed it with an old dress pattern the mounted it to black cardstock. Before I stuck it on, I used Black Soot Distress Oxide with a blending tool through the stencil to create a really cool finish. I love my Gel Press and creating fun little mini albums. This stencil set was ideal for a bright mini album featuring some super funny photos from a dinner party we had a little while ago. You can see the steps on my blog for this one – Happy Daks! I used a simple combination of cool colours and lots of different papers for a great effect! 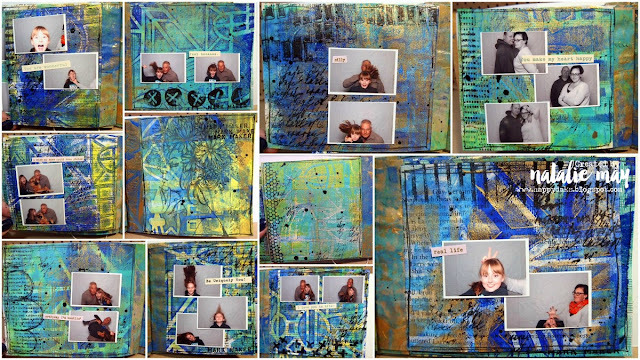 This stencil set works fantastic for layering… in fact I found it really hard to stop! 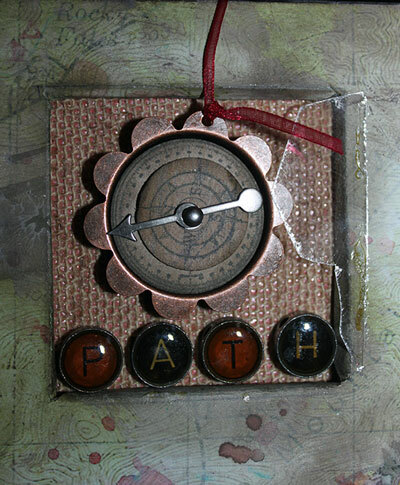 This blue and maroon one is my favorite (of the 3 I made). 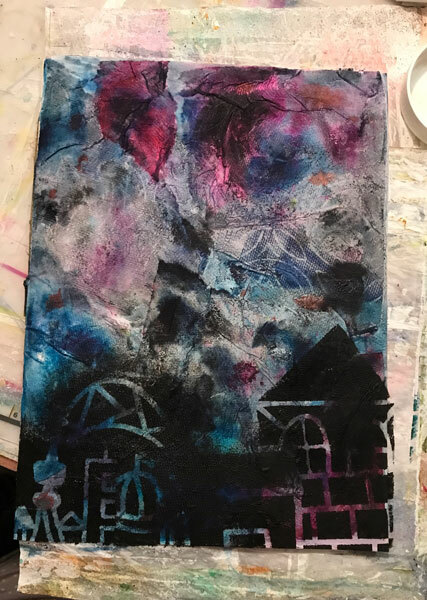 I used a blue cardstock and stenciled with acrylic paint. 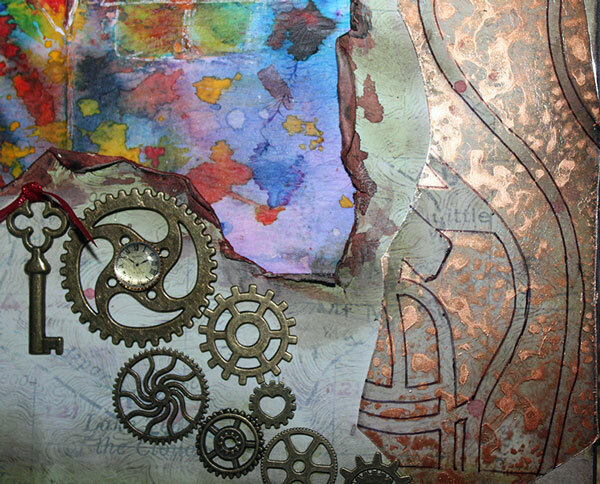 A metallic gold for the sun and light in the windows and a maroon and navy for the rest. I then came in with a white uni ball pen for the details. 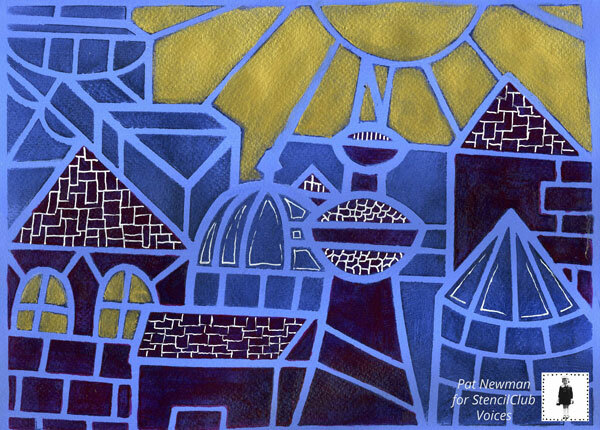 The gold and navy one was done on navy blue cardstock and I stenciled with a metallic gold. I like how it turned out but feel like it still needs something. Time will tell how I add to it. 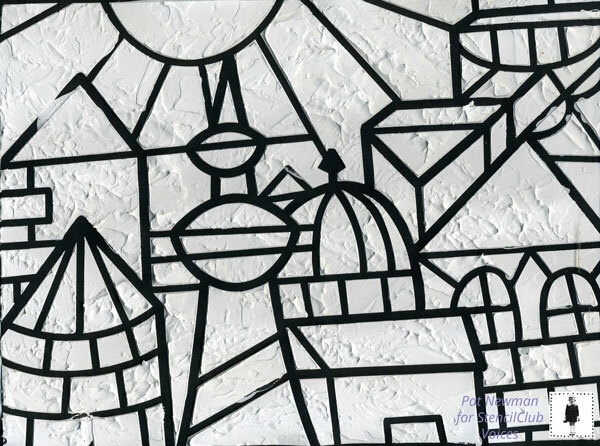 I also used the large stencils on black cardstock with texture paste. 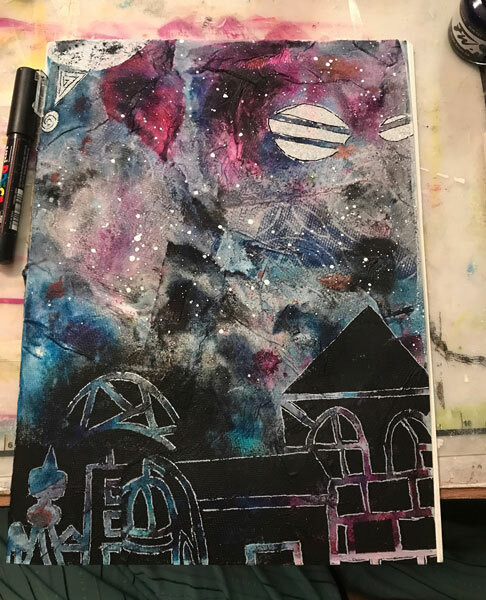 I used watercolors for most of it, because I wanted the texture to show. 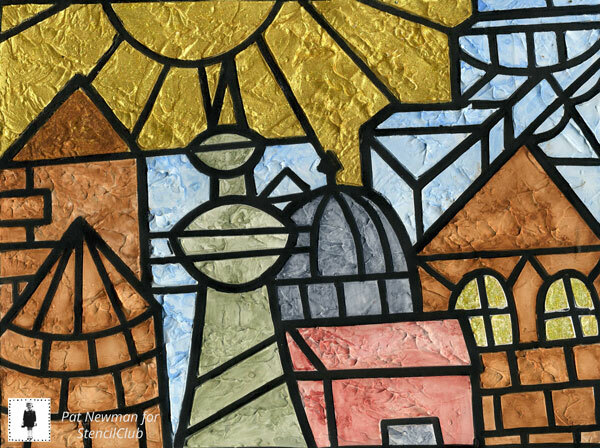 The sun was a metallic paint and then I painted yellow stickles on top of the metallic. The windows were just the yellow stickles, without the metallic underneath. I finished it off by using a black permanent marker to go over all of the spaces between the paste to clean it all up. The large pieces of mica on the right-hand side were sprayed with Distress Mica Spray from Ranger, over the stencil and then outlined with a fine tipped black sharpie. The center portion was colored using ColorBurst, layers were done with gel medium and additional coats of Colorburst. The upper left-hand 3D area with compass and typewriter keys was created using foam core board. 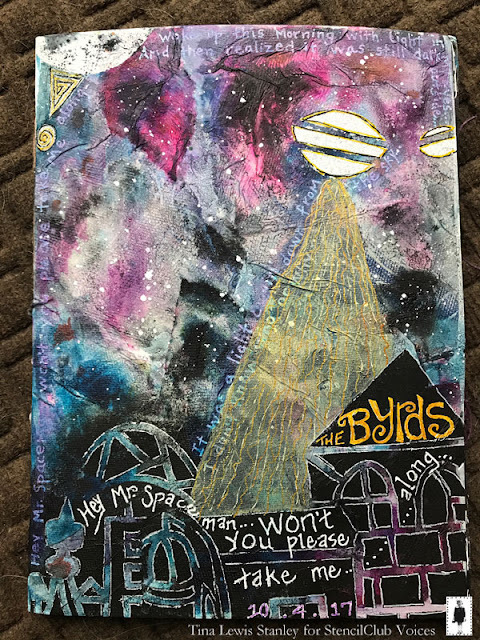 We appreciate how our StencilClub Voices step up each month and share their creativity! Thanks Tina, Natalie, Pat, and Cathy! 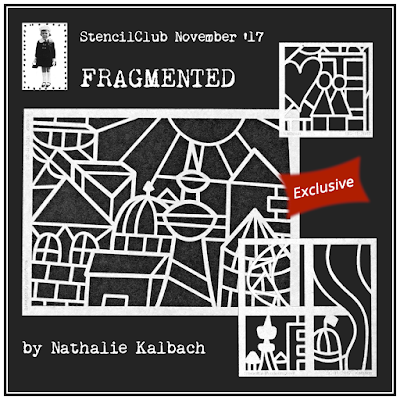 Need Nathalie Kalbach's Fragmented set for yourself? Join StencilClub and you'll get these exclusive stencils, a designer project (Nathalie actually shares 3 with members this month), coupons, advance notice of sales, art community, and we have something super planned for 2018 but we can't tell you yet! 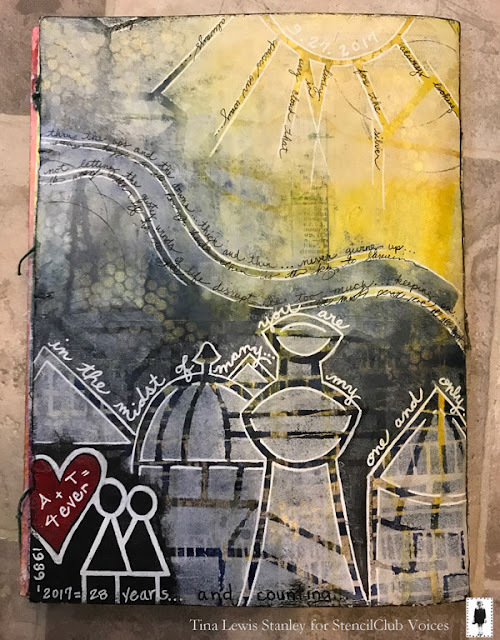 Such amazing projects- I love seeing how you all used my stencil designs for November- thank you so much for sharing- you made my day!